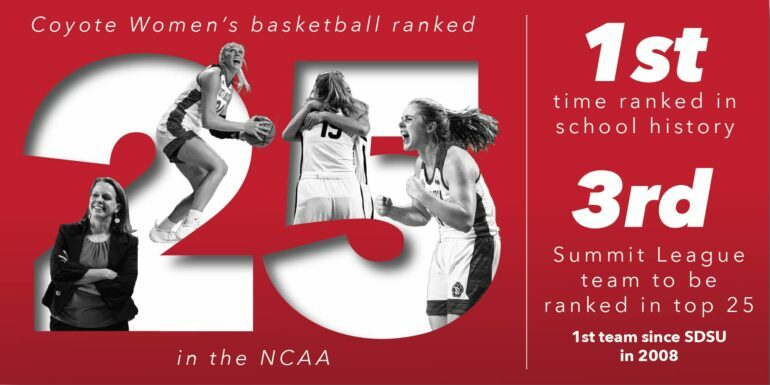 USD women’s basketball landed 25th in the latest Associated Press Top 25 poll. This is the first time in program history that USD has been ranked by the AP. The Coyotes received votes for ten straight weeks before Monday’s latest rankings. “It certainly is a very special honor for the young ladies for the effort and the time they have put in. It just means a lot to our program that we’re continuing to be in the conversation among the best programs out there.” head coach Dawn Plitzuweit said. The Coyotes first received votes this season in early December after beating at the time No. 23 Iowa State. The win was the Coyotes first victory over an AP Top 25 opponent. USD won their second game against a Top 25 opponent on Dec. 15 against then No. 22 Missouri. In other rankings, the Coyotes are second in the collegeinsider.com Mid-Major Top 25 and first in the ESPNW mid-major power rankings. USD also ranked 25th in the USA Today/Coaches poll announced Tuesday. The Coyotes also rank 39th in the RPI. Charlie Creme of ESPN has the Coyotes as an eight-seed in his latest bracketology. He has them playing in Storrs, Conn. against Auburn in the first round. The second round matchup would be either Connecticut or Robert Morris. USD is 22-3 on the season, and their 10-1 record in the conference has them tied for first in the Summit League with South Dakota State. 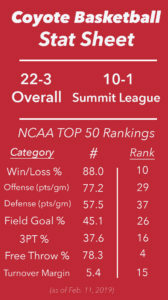 South Dakota State was the last Summit League team to be ranked, who landed in the Top 25 during the 2008-09 season. Sophomore Chloe Lamb grew up in Onida, S.D. and says this is the best place to represent the state of South Dakota. The Coyotes play three of their final five games inside the Sanford Coyote Sports Center. They have yet to lose this season inside the SCSC, and have allowed two opponents to score more than 60 points (South Dakota State and Oral Roberts). The next game for USD is at Western Illinois Saturday, Feb 16. The last meeting between the two was a 92-49 win for the Coyotes.